As a young artist, Christer Glein has developed an established and advanced form early in his artistic career. 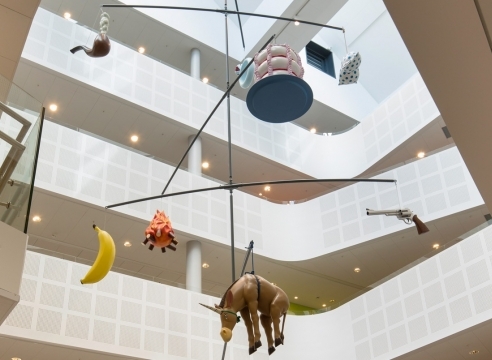 He was first shown at Galleri Brandstrup in the collective exhibition “Selected Works” in 2012, and had his first solo exhibition at the gallery “Equal Measures” spring 2014. The style of Gleins early paintings has often been compared to the German tradition of the Leipzig School. 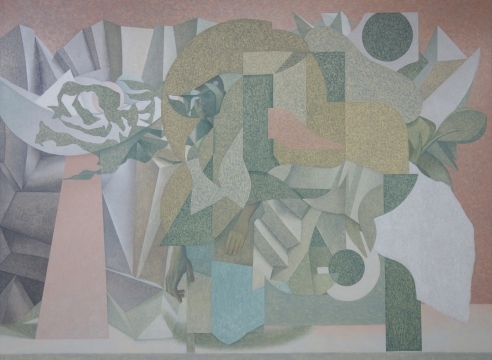 Similar to the Leipzig School, Glein’s earlier works typically showed figurative motives, with a strong emphasis on narrative, and characterized by soft and muted colors. They are consistently traditional and focuses on the basics of traditional fine art. 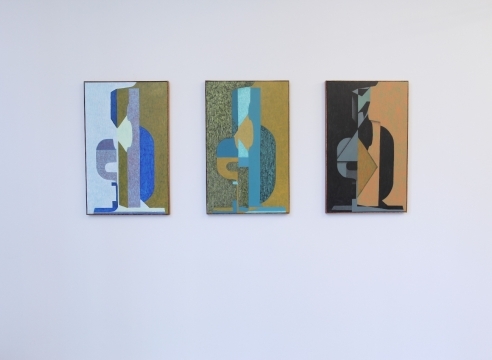 In his recent work, Glein uses a different visual language, while still sustaining a relationship with the classical technique of painting, he introduces an abstract foundation. In the exhibition “Equal Measures”, he separates the pieces in four different series: Front to Back, Layers, Receiver and Essence, displaying new tendencies of exploring the possibilities of the medium of painting. The result is a series of paintings showing a formal distinction between the craft of realism and abstraction, in addition to their roles in art history. In exploring the possibilities of the abstract painting, Glein separates between two different techniques. On one hand, one can recognize the loose and rough brush strokes of expressionism and on the other hand, the abstraction of Supremacism, which is characterized by its sharp edges. The formal elements are precise and exact, placed within the abstract universe of different elements. Glein also explores the formal elements within the figurative; for example by stretching a body over the canvas in an almost baroque mannerist way, recalling the expressionistic bodies of Egon Schiele. As he combines different associative material in to one canvas from different traditions in art, one can analyze his paintings in an echo of poststructuralist thinking response to structuralism. The exhibition “Equal Measures” blurs the lines between the structures. As Glein takes different symbols from their historic context and places them together again, he breaks trough the way we view art history as a linear chain of styles. He creates a new, full and complete visual language, despite of their characteristics of a wide diversity of historic movements. Christer Glein has been represented by Galleri Brandstrup since 2012.